We all have a little kid inside of us, don’t we? Hey, I’ll admit it: my inner child still loves playing dress-up and eating the heads off of gummy bears. Well, Jeremy showed me exactly what his inner child always dreamed of when, on a whim, we decided to head up to Northern Wales for a few days. 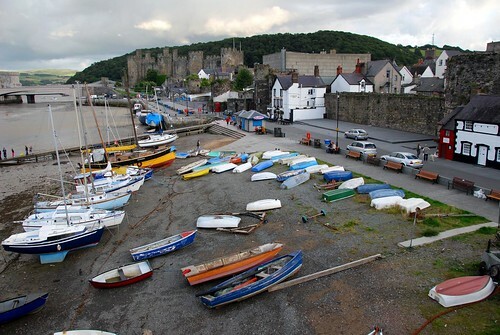 The promise of castles and old city walls around a town called Conwy had Jeremy’s inner child squealing with delight. Even better: we would be sleeping in bunk beds at our youth hostel (and I let him have the top bunk). Castles, swords, city walls, AND bunk beds? I am pretty sure that 10 year old inside of Jeremy just had his mind blown. My knight in shining denim. 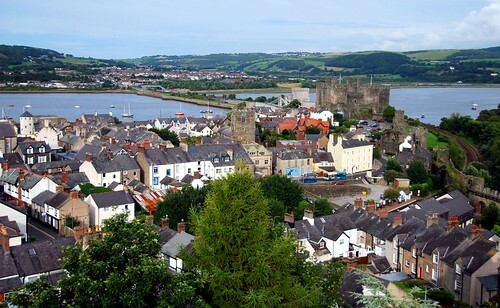 Conwy is a lovely little town located on the coast of North Wales. We rolled into town in the late afternoon, with enough time to walk the old city walls, which enclose this little fishing village by the sea. The view from atop Conwy’s old city walls. The following day, we prepared to invade not one but two castles. The first, in a little town called Caernarfon, is (like Conwy) another picturesque little town by the sea famous for its lovely views from atop its lovely castle. Entering the castle, I noticed that most visitors had kids with them. I felt a bit silly when we got up to the ticket gate and asked for “two adults.” That is, until I saw the look of glee in Jeremy’s eyes. The joy in his inner child’s heart was just priceless. I even felt like a proud parent as he ran around shooting fake arrows through the castle’s many “murder holes” (yes, that’s what they’re called). 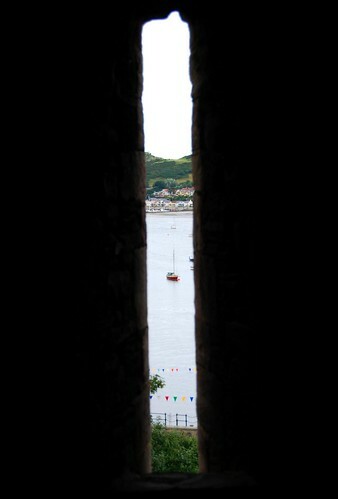 View through one of Caernarfon Castle’s murder holes. 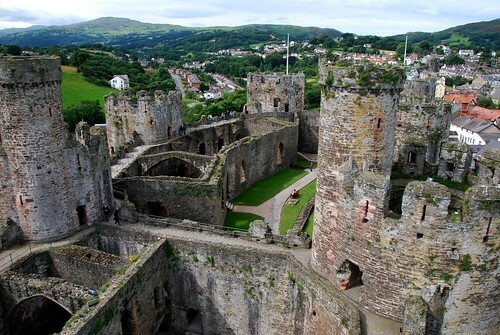 Though not as large, Conwy’s castle is equally impressive. Tucked into a corner of the square created by the city walls, the castle allows beautiful views of the town and the sea. Conwy castle, with views of the surrounding city and countryside. 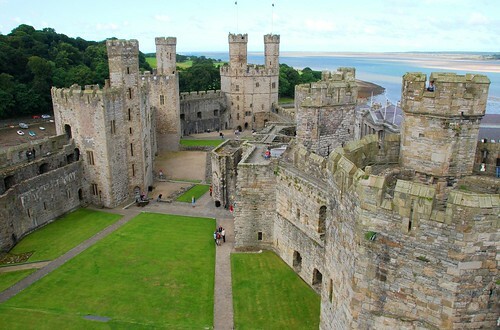 We learned quite a bit about the United Kingdom from our visits to Conwy and Caernarfon. In fact, these castles were built not to protect the Welsh from invaders, but to project English King Edward I’s power into Wales. Charles was crowned Prince of Wales at Caernarfon Castle (as all that are next in line for the throne), a kind of reassertion of the UK’s dominance over Wales. See, like Northern Ireland, Wales wants it’s independence. And it makes sense why they would—the Welsh have their own traditions, their own food, and of course, their own language. Speaking of which, Welsh is crazy! One look at the written word and you know that Welsh has absolutely no relationship to Latin. The Welsh language looks like it was created when someone accidentally rested their elbow on the keyboard. Ddwylodd. That’s probably a word in Welsh. All joking aside, even though they do not express their desire for independence in a violent manner, this is a pretty serious issue for many Welsh people. 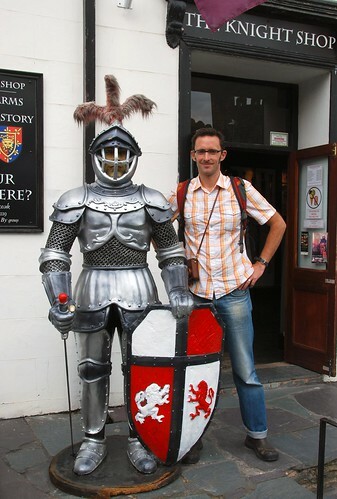 Quite frankly, before our visit, I knew very little about Wales. Perhaps this was ignorant of me, but my impression of the UK was most closely associated with England: you know, Big Ben, powdered wigs, and bucolic countryside scenes like those we saw in the Cotswolds. I knew that Scotland and Northern Ireland were quite different culturally from England, but I didn’t have a sense of Wales. I certainly didn’t realize how distinctly different the four “home nations” of the UK (England, Scotland, Wales, and Northern Ireland) would be. I am humbled and continually amazed by the number of things we learn from our travels. Without this experience, there are so many details and intimacies I never would have known about this world! 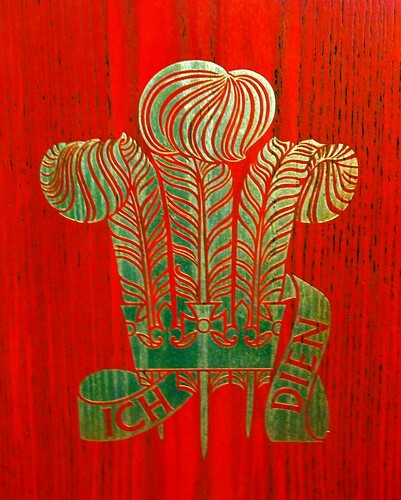 The Prince of Wales’ Feathers, a royal badge which is controversially used by the royal family to symbolize Wales. Not only is Wales it’s own animal culturally, but physically the landscape is quite different too. Of course, it is much wetter in Wales than in England (though luck was on our side in Wales—we had rain only one morning during breakfast and it was glorious sun the rest of the time we were there! 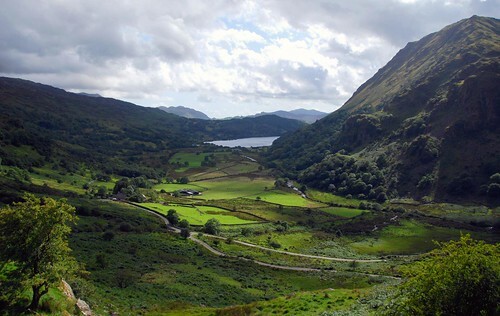 ), but the North Wales area is also home to the tallest mountain in both England and Wales: Mount Snowdon. Whereas we saw gentle, rolling hills in the Cotswolds and Oxford, Northern Wales has some pretty dramatic mountain scenery. The Welsh countryside near Snowdonia National Park. But Northern Wales isn’t just about big mountains and castles. As part of our entrance ticket to Conwy castle, we also saw an old Elizabethan house called Plas Mawr, which had fascinating displays detailing life in the Middle Ages. They had info on everything from the sewer system to strange medical procedures to toilets to diet. It was incredibly interesting, and the house wasn’t too bad looking, either! 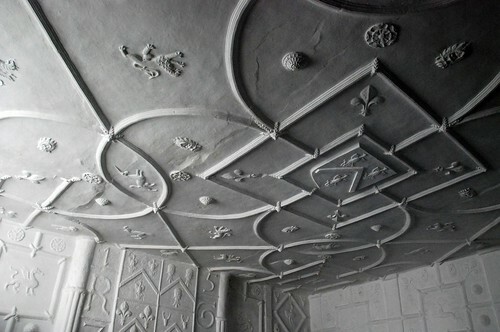 I was totally obsessed with the decorative plaster work covering the walls and ceiling in Plas Mawr. What a wonderful time we had in Conwy and Caernarfon! Old city walls, castles, verdant mountain scenery, and old Elizabethan houses…turns out North Wales had more than a few things to appeal to my inner child as well. Where we slept in Conwy: We stayed at the Conwy YHA, which was located up the hill outside of the city walls. Even though it was kind of hike out of town to get back to the hostel, the views were stupendous! The hostel itself was clean and comfortable, thought our room was very tiny, and they charged extra for towels. I think staying at a B&B in town might have been better value…though you certainly won’t get the same vistas. When people ask my husband where he grew up, he says “I didn’t. He’s still a little boy in many ways — right Jeremy? Excellent blog. Very interesting stuff, especially as I’m in North Wales visiting the castles at the moment.